Raised dog bowls are recommended by veterinarians for geriatric dogs, dogs of large breeds - such as Great Danes and German Shepherds - and dogs with certain medical conditions. Raised feeders provide ease of access to food and water which can help facilitate movement of food when traveling from the mouth to the stomach. Consuming food from elevated dog bowls places less strain on the dog's neck, hips, shoulders and joints, which promotes better posture. This is a major importance for dogs of advanced age and those with arthritis. Using an elevated dog feeder keeps the feeding area cleaner than if you merely placed the feed bowls on the floor. Furthermore, raised dog feeders are easier to clean. No more getting down on your hands and knees to scrub the feeding area clean. Instead, you simply wipe the surface of the feeder table clean. Reduce sloppy behavior: some dogs find joy in splashing the water out of their bowl and on the floor. Using elevated dog bowls helps to minimize this type of behavior. Make the dog food "stay put": It is not uncommon for dog bowls to slide across the floor as the dog is trying to enjoy his dinner. Switching to raised dog bowls provides a stable feeding surface that your pup doesn't have to chase as he's trying to eat. Make it easier on yourself: Raised dog feeders raise the bowls off the ground which means owner's don't have to bend down as far when filling the bowls. This eliminates unnecessary strain on the back. Healthy Diet: The wrong diet weakens the stomach lining. The stronger the stomach lining, the less susceptible your dog is to bloating. The raised dog bowls help stronging the stomach lining and avoiding excess air intake. Less Strain More Health: Stress of any kind is believed to be one of the biggest factors in dogs bloating. Consuming food from elevated dog bowls places less strain on the dog's neck, hips, shoulders and joints, which promotes better posture. 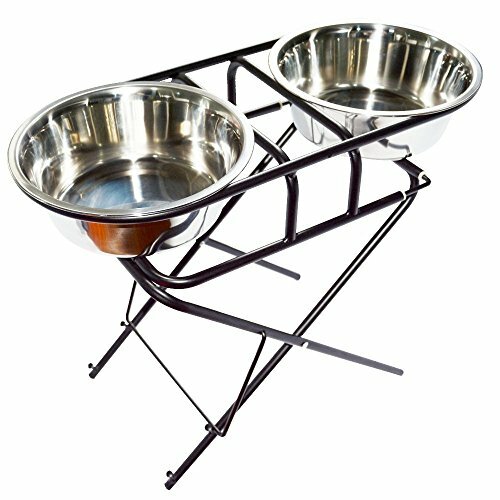 Height Adjustable: Elevated dog bowl can be adjusted to 4.5 inches, 7.4 inches and 14 inches. Equipped with 2 stainless steel 1.5 Quart matching bowls. Perfect for medium to large dogs. Keep Stay In Place: Made of sturdy metal with rubberized non-slip feet. Can be used on any types of floors. Recommend using on a food mat to prevent food or water spill out. If you have any questions about this product by EXPAWLORER, contact us by completing and submitting the form below. If you are looking for a specif part number, please include it with your message.